Fourth Row Center: Film Writings by Jason Bailey: On DVD: "George Lopez: Tall, Dark, and Chicano"
On DVD: "George Lopez: Tall, Dark, and Chicano"
When stand-up comedy took a creative plunge in the mid-1990s, there were several causes—oversaturation, predictability, prop comics, etc. But mostly, fans came to resist the general hackery of the lesser lights who were suddenly getting TV time: comics who compared New York to L.A., complained about airline food, and (particularly on the once-groundbreaking, then cringe-worthy Def Comedy Jam) noted the differences between black people and white people. White people are more uptight, you see. And they speak with nasally voices. And they’re poor dancers. It’s funny because it’s true! The “white people do that, but black people do this” school of comedy is mostly played out (thankfully), but Latino comic George Lopez is doing his damndest to bring it on back. Here’s the twist: he compares Latino people and white people! Clever, eh? His most recent HBO special, George Lopez: Tall, Dark, and Chicano is excruciatingly overlong at nearly 90 minutes, but it boils down to two pieces of commentary: a) there are many comical differences between Latinos and Caucasians, and b) the world is very different for people growing up today than it was when people of his generation were growing up. Who knew, right? I bear no ill will towards Lopez; I was never a fan of The George Lopez Show, but plenty of good stand-ups have done bad sit-coms. To be sure, Lopez is energetic and he’s got good timing, but the material is just plain weak. The jokes are frequently slapdash and poorly worked out, as if he didn’t take the time to hone or refine them; it mostly amounts to grinding away at the same old saws. Here’s how a typical Lopez bit goes: He’ll talk about something that society in general, but mostly white people in particular, will do. Then he’ll note that “Latinos don’t do that! We--” and then he’ll proceed to explain the subtle and nuanced cultural differences. When he runs out of those jokes (which takes longer than you’d think), he goes into his other crutch: he’ll talk about some social norm or extravagance enjoyed by today’s generation. Then he’ll explain, “It wasn’t like that for us! We--” and off we go again. It’s not that there aren’t laughs to be wrung out of these types of jokes; hell, Richard Pryor did the white people/black people stuff decades ago, and it still plays. But that’s because Pryor was coming from a place of honesty and humanity; Lopez relies on cheap punchlines borne out of lazy, obvious stereotypes. But even that isn’t reason enough to discount the special—those stereotypes can get big laughs, as anyone who watched Chapelle’s Show can attest. But the laugh lines have got to be stronger than these; in one section, for example, about the names white people give their kids, he surmises that a Latino would never name their child “Chance”: “I named you Chance—because I wasn’t sure you was mine.” Haw haw! Get it, because, there’s a “chance” that he wasn’t, and… yeah. The obviousness of George Lopez’s concepts and construction, and the easy stereotyping of his laugh lines, wouldn’t matter if the material was funny. But with occasional exceptions (“You don’t think we speak English? We speak English. We speak Spanish because we don’t want to talk to you!”), Tall, Dark, and Chicano just isn’t funny. And on a stand-up comedy special, that trumps everything else. 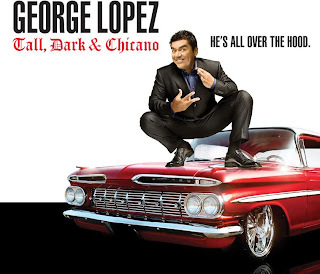 "George Lopez: Tall, Dark, and Chicano" is currently available on DVD. On DVD: "Kobe Doin' Work: A Spike Lee Joint"
On DVD: "It Might Get Loud"
On DVD: "(500) Days of Summer"